Volume 43, number 4 of The Cougar Chronicle. The issues focuses on stories of cultural diversity. 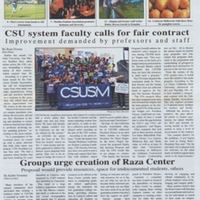 Other topics include a demonstration in support of the CSU system improving faculty contracts and a proposal to create a Raza Center for Latino students. October 22, 2014,” University Archives at the CSUSM Library, accessed April 18, 2019, https://archives.csusm.edu/student-newspapers/record/143.